How did this Jeep leave the factory with the wrong parts? Upscale versions of the Jeep Wrangler now eschew the bare plastic trim for painted wheel arches and roofs. But one owner, after taking his 2012 Jeep Wrangler Sahara home, noticed that the wheel arches on one side weren't color-matched. 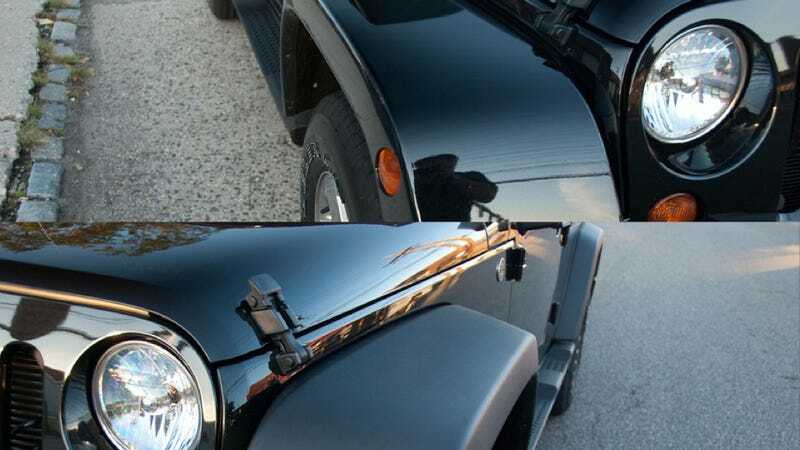 In fact, they were the wheel arches from the 2011 model year Wrangler. That's got us wondering how the hell this Wrangler left the plant like this. Luckly,"mathjak107," a JeepsUnlimited forum member, says the dealer has vowed to fix the mismatch under warranty, installing the proper black painted wheel flares on the driver's side instead of the Rubbermaid-like plastic ones. But it's a little strange that no one noticed the switcheroo until now.